The LiveEdu ICO has gotten off to a great start with over $7M raised so far. The public sale opened on Jan. 15th, 5pm UTC with a 20% bonus on the first day. Bonus dropped to 17% on the second day and then drops by 1% every two days until it reaches 5%. The official end date of the ICO will be Feb. 10th unless the $10M hard cap is reached before. 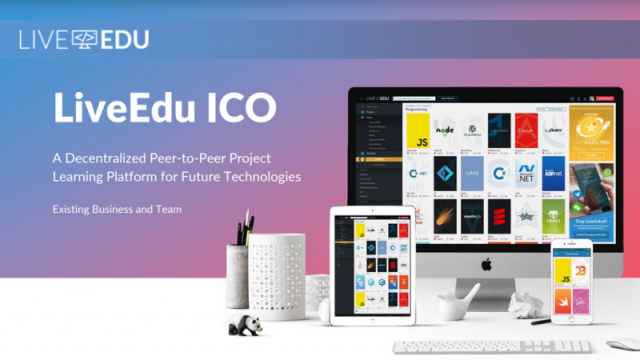 LiveEdu is a decentralized learning ecosystem that teaches people how to build complete products in future technological fields. They are building the YouTube for professional development. You can also describe their ecosystem as the next-generation Lynda.com. Unlike existing online education platforms, LiveEdu is not focused on beginners, but mainly intermediates to experts. People learn on LiveEdu by watching how peers build real projects and can also download all project resources and files. The new LiveEdu platform is set to launch in 2018 and will start with eight main topics which encompass several subcategories: Artificial Intelligence, Cybersecurity, Game Development, Data Science, Cryptocurrencies, Programming, Design, and Augmented and Virtual Reality. Project creators in the LiveEdu ecosystem will build 10,000 projects for these topics. In 2019, the ecosystem will be open for all topics. The LiveEdu Artificial Intelligence topic explores the ability of a digital data processor or information processing system-controlled robot to perform tasks commonly associated with intelligent living beings. It is comprised of the following subcategories: Computer Vision, Natural Language Processing, Machine Learning, Robotics, and Self driving car. The LiveEdu Game Development topic facilitates the emergence of new technologies to make it possible to develop better and more powerful games. LiveEdu holistically improves game development in the following subcategories of GameDev, Unity, Love2D, Unreal Engine and GameMaker. Under the LiveEdu Cryptocurrency topic we delve into the greatest revolution in the finance industry in the last millennium. The subcategories are Cryptocurrency Basics, Ethereum, Security and Hacking, Blockchain Mining, BitCoin, and ICOs. The LiveEdu Design topic is focused on a specific problem in human experience and endeavoring to improve said experience. It comprises the following subcategories, Art and Illustration, Mobile App Design, Logo design, Web App Design, and UX design. The LiveEdu Virtual and Augmented Reality topic hurtles you into the great beyond and boldly go where no other online education has taken VR & AR. It covers the subcategories of VR Games, Desktop and Console VR, Augmented reality and Mobile VR. ICO contributors will have voting rights for every key decision in the ecosystem which includes advising which new topics or product features are to be added.